Chrysoprase Known for its apple-green colour, chrysoprase has been coveted for centuries for its striking beauty. The name chrysoprase is derived from the Greek chrysos and prase, meaning ‘golden leek’. Throughout history, chrysoprase has been a popular choice for cameos, with examples appearing in Greek, Roman and Egyptian jewellery. Victorians also loved chrysoprase, cutting it into cabochons. Some of the most valuable specimens come from Australia – that’s why chrysoprase is also known as Australian Jade. Other primary deposits are found in Poland, Brazil, India, Madagascar, Russia, Africa and Germany. Chrysoprase belongs to the chalcedony gemstone family. One of its distinctive features that sets it apart from other types of quartz is that it is a cryptocrystalline. This means that crystal composition is so fine that it can’t be seen under normal magnification. Chrysoprase was prized by the ancient Greeks and Romans as they believed it had powerful healing properties. Alexander the Great was said to carry chrysoprase into battle to ensure victory. 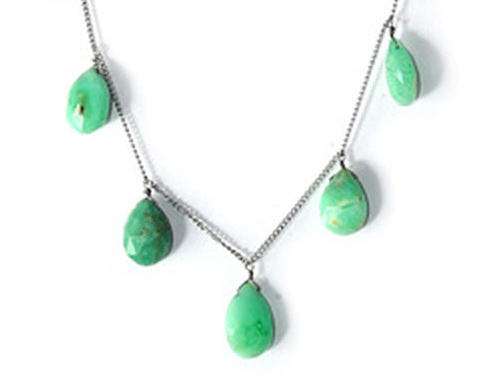 In the 1800s it’s said that thieves believed placing chrysoprase in their mouth would make them invisible!